If you're going to fry donuts, you may as well go all out and make glazed chocolate frosted donuts. And make them coffee flavored for good measure! In a small saucepan, heat milk until it's warm but not hot, about 90 degrees. Pour milk into the bowl of a stand mixer or other large bowl if using an electric mixer) and sprinkle Fit stand mixer with dough hook or use electric mixer to beat the eggs, butter, sugar, coffee grounds, and salt into the yeast mixture. Add half of the flour (2 cups 1/4 cups) and mix until combined. Mix in the rest of the flour until the dough begins to pull away from the sides of the bowl. If dough feels too wet, add more flour, 1 tablespoon at a time. If the dough becomes too thick to knead in the mixer, transfer it to a lightly floured surface and gently knead it until smooth. Grease a large bowl with a little oil, transfer the dough to the bowl, and cover with a kitchen towel. Let rise at room temperature until dough doubles in size, about 1 hour. Turn the dough out onto a floured surface and roll to 1/2-inch thickness. Cut doughnuts with a lightly floured doughnut cutter, cookie cutter (one large and one small), or a drinking glass (and shot glass), making sure the larger round is 3-3 1/2 inches in diameter. Reserve donut holes. After cutting donuts from dough, knead any leftover dough together again, taking care not to overwork and let rest for a few minutes before rolling out and cutting again. Place doughnuts on two floured baking sheets, leaving about 2 inches between each one. Cover with a kitchen towel and let rise in a warm place until dough is slightly puffed up, about 45 minutes (if your kitchen is too cool, you can pre-heat oven to 200 degrees, turn off, and then place pans in oven with door slightly cracked). When donuts are almost done rising, put oil in a heavy-bottomed pot or Dutch oven over medium heat and bring to 375 degrees. While oil is coming to temperature, line cooling racks, baking sheets, or plates with paper towels. Carefully place donuts in oil, a few at a time (you can use a metal spatula if they're too delicate to pick up with your hands). Fry for 30-45 seconds, until bottoms are deep golden, and then use a slotted spoon to flip and cook for another 30 seconds until donuts are golden all over. Transfer donuts to the prepared plates or racks and repeat with the rest of the dough, keeping oil at 375 degrees. Once donuts are fried, repeat with donut holes, taking note that these will fry faster than donuts. 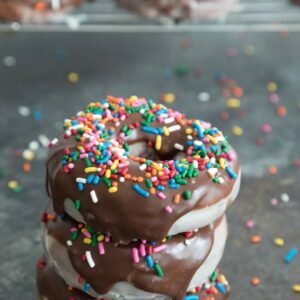 Once donuts are cool enough to touch, dunk in glaze, flip over and dunk again, and let excess drizzle off before placing on wire racks with paper towels underneath to catch any additional excess glaze. Let glaze harden before dipping tops of doughnuts in chocolate frosting and adding rainbow sprinkles. In a medium bowl, whisk together confectioners' sugar, milk, and vanilla until smooth. If glaze is too thick, add additional milk 1 tsp at a time. In a medium bowl, whisk together, confectioners' sugar, cocoa powder, milk, and vanilla, If frosting is too thick, add additional milk 1 tsp at a time.